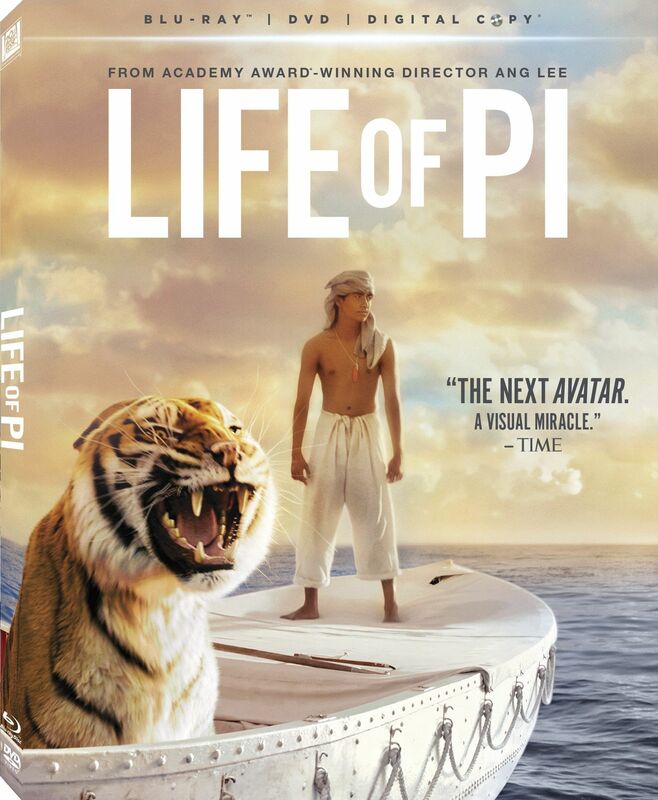 Blu-ray Review: "Life of Pi"
Life of Pi is a technical miracle and a spiritual wonder. Life of Pi is a technical miracle. Even without the 3D elements jumping off the screen, the visual wizardry overseen by Ang Lee and created by the Academy Award winning visual effects team is without a word stunning. After reviewing the supplemental materials on the Blu-ray, I would say that close to 90% of this film was created using computer generated effects. The powerful storms, the glorious sunrises, the sinking of a massive ship, and most importantly, the animals that share a lifeboat with a young man named Pi were all created by CG artists. The Bengal named Richard Parker was so flawlessly rendered, it even fooled the animal trainer who advised the filmmakers and provided them with access to living, breathing tigers. Life of Pi is definitely worth seeing to appreciate the years of human labor that went into making everything in the film seem real. However, Life of Pi is also worthy of repeated viewings because it is so beautifully told by Lee and his screenwriter, David Magee. This is a film that will challenge viewers to look deep within to ask what they believe. Based on the bestselling novel by Yann Martel, the film is narrated through flashbacks. A middle-aged, suburban father named Pi (Irrfan Khan) shares an afternoon with a novelist (Rafe Spall), who was told by a stranger to seek out his friend (Pi) to hear his remarkable story. Born in India, Pi’s parents ran a zoo while raising him and his older brother, Ravi. A curious young boy, Pi yearned for spiritual truth. He explored Hindu, Catholic and Muslim faiths, finding comfort in all three, despite his father’s distaste for religion. The young man’s spirituality is tested during the story’s 2nd act. Pi, now 16, is sailing across the world from India to Canada. His family has left their homeland due to pursue a new life in Montreal. They have brought with them all of the animals from their zoo, which they will sell off in the United States and be able to live a comfortable life. Tragically, their boat runs into a massive storm and the voyage is doomed. Pi manages to get aboard the only lifeboat, seemingly alone. He watches the ship go down and must find a way to keep his strength knowing that he will never see his beloved family again. However, Pi quickly discovers that he is not alone. Miraculously, a zebra, a hyena, an orangutan and Richard Parker, that dangerous tiger, have also survived and living in the boat with him. Richard Parker quickly devours the other zoo animals and Pi creates a makeshift raft that keeps him tethered to the boat, but a safe distance from Richard Parker. If Pi is to survive, he must find a way to co-exist with the tiger. From there, the film becomes a story of survival, both spiritual and physical, with Pi (and Suraj Sharma, the young actor portraying Pi) losing weight and possibly his mind. I have not read Martel’s novel, but I hear it is challenging and that many believed it near impossible to translate into a movie. If that is the case, Lee and Magee have done a remarkable job. Life of Pi is a very accessible film, with a narrative construct that makes it easy to follow. Visually, the film is gorgeous to watch. Shot in 3D, it does have a few of those moments where it seems like Lee is showing off (a digital hummingbird, a stick pointing at the camera, etc. ), but for the most part, you don’t have to see the film in 3D to get swept away by it. The score, by Academy Award winner Mychael Danna, is exceptional and hits all the right emotional points to keep you invested for the film’s long running time. However, it’s Sharma that makes the film work. This young actor carries the entire film on his back, succeeding, and then some. The bonus features throughout the Blu-ray go to great lengths to show off the exceptional work of the visual effects teams and the great care that went into making Life of Pi not look like a CG movie. Despite the knowledge that so much was created in the computer, you quickly forget simply because the craftsmanship of the CG artists far exceeds anything I’ve seen in a long time. You also forget because the story is so compelling and leaves you emotionally drained and uplifted by the end.